Perhaps you've already seen this video? After one week it has 'gone viral' and caught the imagination of a continent! There are t-shirts coming and a scholarship has already raised more than a quarter of a million dollars for Caine, and also in support of creative programs for young people in the East Los Angeles area. When participants start art therapy - especially private sessions, one of the difficult aspects is letting go of their Inner Critic to allow them to create freely. Having made the decision to give themselves a time out they get a quiet, uninterrupted hour (or more in a group) to allow their creativity some stillness and space to show up and be noticed. Once that begins there is much relief and some deep healing can begin! It is interesting thinking about the story of Caine. 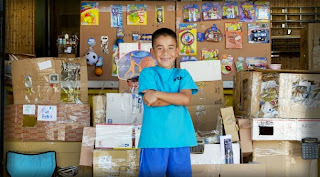 He is 'our' hero as he gets into Flow and creates an arcade of his dreams out of cardboard. Wow! Every day he goes to work with his father - all through the summer - to make his dream a reality. We see his enthusiasm and the loving support of his father. Some great parenting happens when Caine wants to buy a grappling hook of sorts for one of his creations, but his father resists the urge to help and get his son one. Instead, Dad lets Caine know he is confident that he can make it himself - and he does! I think what really captures our hearts is the way Caine is ignored! He has no customers, and in the fall his schoolmates don't even believe him - and make fun of his arcade t-shirt. Many of us can relate to a time when no-one else seemed to believe we could do something. The desire to create and share something was strong, but maybe we allowed that to be quashed because of lack of support and fear of failure. Seeing Caine follow through and stick with it, even though nobody comes, is a vibrational match to what we envisioned for ourselves! He is the unsung hero! Then there is the pivotal visit by "his first customer" and (Divine intervention?) a film-maker who asks permission to make a small movie about Caine and his Arcade....and the rest is unfolding in L.A. and online! I hope for Caine's sake this is a spark in public awareness that raises some money for school and creative programs, and then settles down again so Caine can continue to create from a place of stillness and solitude. No matter where you are, with these key ingredients creative sparks fly....and your life continues to unfold as it should!